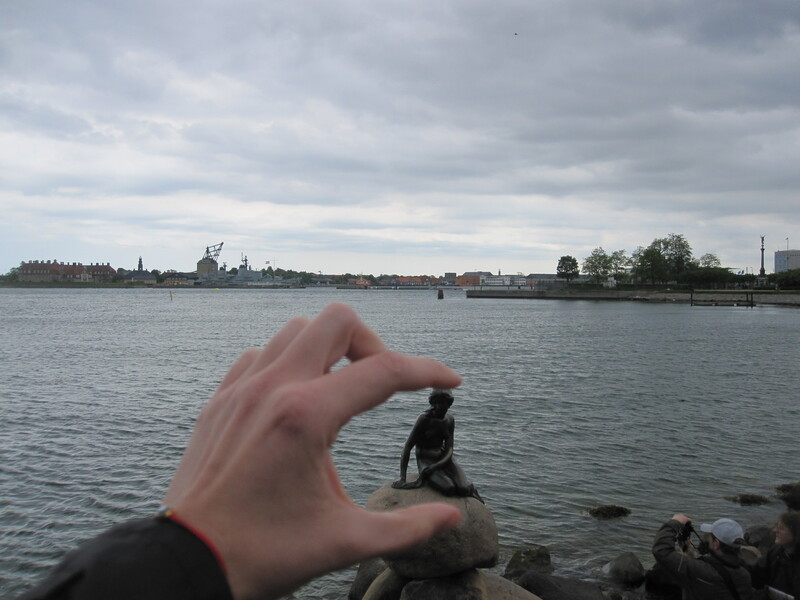 Copenhagen! I landed in my new favorite city Friday afternoon, to spend a welcome rainy weekend away from the stifling heat of Madrid. Upon my arrival we bought some supplies to make curry and set about playing King’s Cup (Danish rules are way better than American) to pass the time until Blanca arrived. Unfortunately, the flight was delayed, and by the time she landed around 1am we had played one too many games, and were all ready for bed. The next morning after a delicious breakfast of chocolate milk and an assortment of Danish pastries smothered in cheese and jam, it was time for my one day whirlwind tour. Our first stop, at the request of Blanca, was a visit to the Little Mermaid statue. On the metro ride, the homeless people that normally come with every major city were noticeably absent, and everything was just so clean and shiny and new. I also couldn’t help but notice how almost everyone was really actually stunning, working that whole blonde, tall, blue-eyed thing. Hardly seems fair to the rest of the world. We strolled along the seaside, and were first able to spot the statue’s location due to the throngs of Asian tour groups snapping photos. Once I finally managed to push my way through the crowds, I felt the same way as when I saw the Manneken Pis statue in Brussels… confused. Huh??? I still can’t understand what the big fuss was all about, especially because there were so many other beautiful statues that we’d passed along the way. Anyways, it was still a very pretty area, right on the water (as I guess most things tend to be when you’re on a little island), very green, with tons of canals and stone bridges. From there we mozied over to the harbor and enjoyed a beer while dangling our feet over the canal and watching the boats pass by. We continued walking to the Queen’s Palace, and happened to get there right in time to see the changing of the guards. To me the lack of security was crazy, aside from maybe 10 guards wearing awesome over-sized hats (who are actually the only people allowed to carry loaded weapons in Denmark) there wasn’t anything else preventing you from walking right up and touching the door. After seeing the giant domed cathedral nearby, we walked down the street that I was told was the equivalent of Park Place in Danish Monopoly. I was pleasantly surprised, normally I feel like these places are all kind of the same, they exist in every major city, with the same kinds of people and the same stores. If you’ve seen Rodeo Drive in LA, then you’ve seen Fifth Avenue in NYC, or Serrano in Madrid, etc. Here though, instead of being full of ‘pijo’ stores, the street was full of art galleries with really interesting pieces and hip indie boutiques, it was a lot of fun window-shopping. 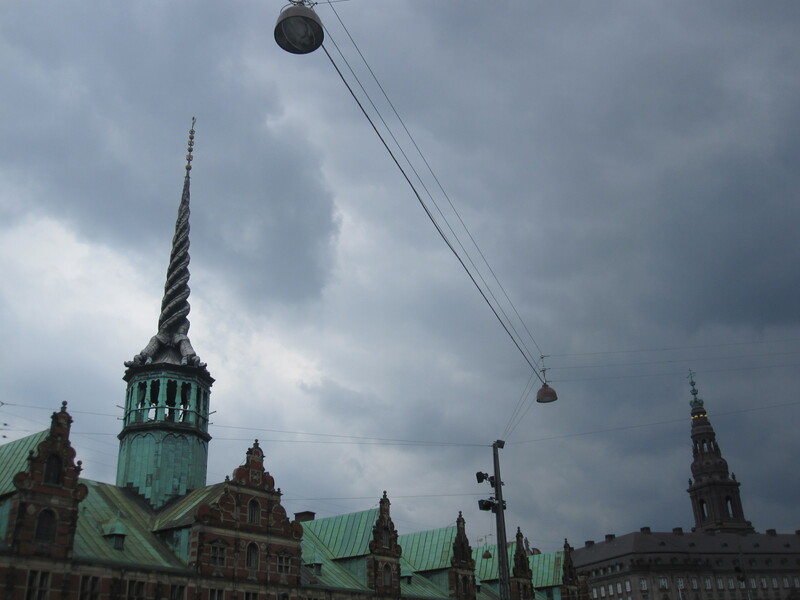 In general Copenhagen was just lovely to walk around, big boulevards lined by cool old buildings, their formerly copper roofs turned green with time, and very few cars, since nearly everyone bikes. 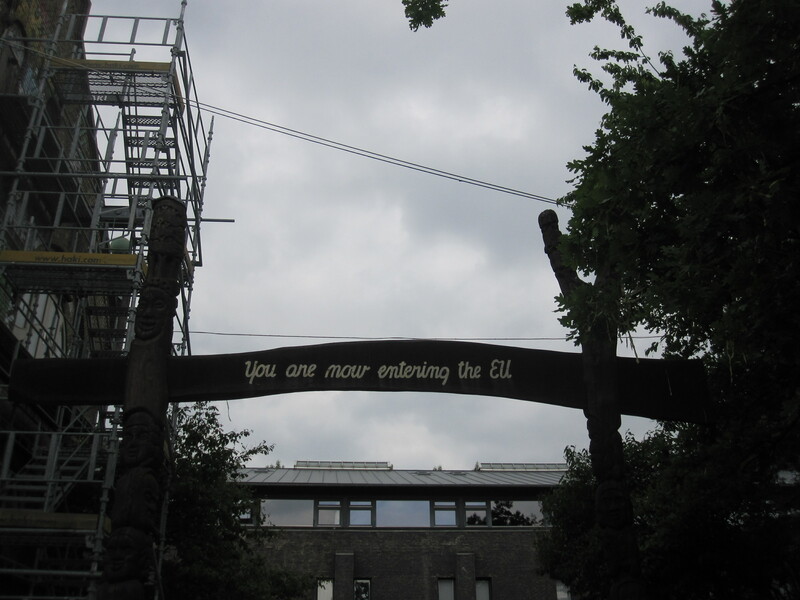 After our visit to the fancy part of town, we made a stop at the other end of the spectrum, to a self-proclaimed autonomous community called Christiania. It’s hard to even begin to explain it, basically it’s a bunch of hippies who in 1971 took over an abandoned military complex and began squatting on it and refusing to pay taxes. From there it continued to expand, and now is full of quirky self-built houses, workshops, stores, art displays, parks and cafes. It reminded me of the Tabacalera (http://latabacalera.net/ LINK) in Madrid, but on a much bigger scale. You weren’t allowed to take pictures inside, which is a shame, because it’s really amazing, I’ve never seen anything like it. From there we walked back towards the center and climbed up the Round Tower (bet you can’t guess why it got it’s name) for a spectacular 360 degree view of the city. After climbing back down we realized we were starving, and visited one of the countless hot dog stands found on nearly every corner. We split a hot dog ‘Danish style’, which is everything you’d normally put on a hot dog, except with the addition of this white tangy sauce called remoulade. We also shared a frikadellesandwich, essentially a hamburger, except the meat is pre-chopped and softened, so you barely even need to chew, mmmm, laziness at it’s finest. After giving our feet a rest back home and watching a Danish dodgeball tournament (Gingers vs. Marines), we began our night. Danes go out harder than Spaniards, which I didn’t even think was possible. We left the house pre-party at 3:30 to head to the bars, right as dawn was breaking. It was a strange feeling standing in a smokey pub, pint in hand, watching the sun rise. The night ended just in time for me to wolf down a kebap, grab my bag, and head to the airport for the long journey home. I slept 12 hours that night, and now I’m feeling fresh and ready to show the Californians around my city this weekend. 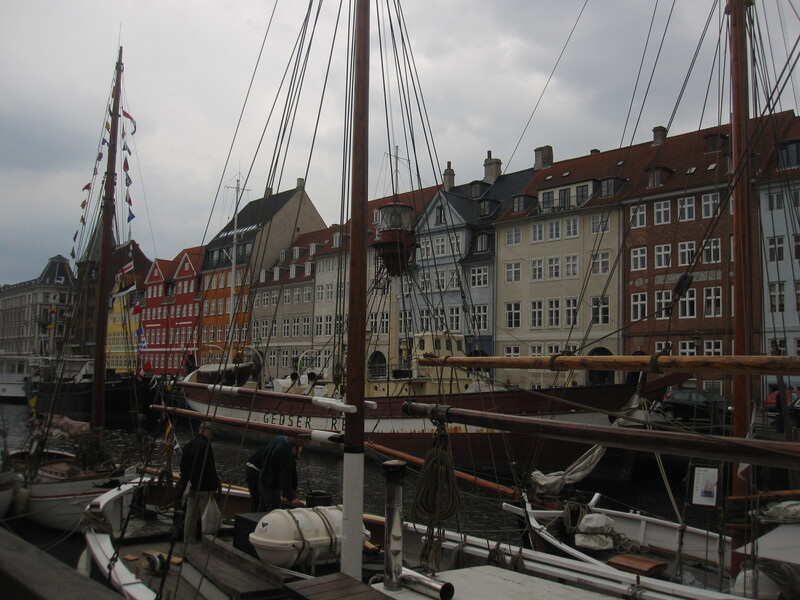 I really loved Copenhagen, and maybe if I’m good enough in this life, I can come back next time as a Dane.